I’m definitely sparring (good-naturedly and with the will, not the hands) on the home front with my family of five. 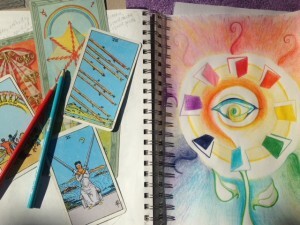 I almost posted this to my Feral Mom, Feral Writer blog, but it is a beautiful example of a Five of Wands experience…. Every family goes through the “New School Year, New Routine” adjustment and we are no exception. The circuit of falling dominoes started to pick up its momentum last night when I removed myself from the family equation for two hours to attend Back to School Night…running late like a kid myself for each bell….which meant dinner didn’t get made in my absence….which meant homework wasn’t started til after 10 pm…which meant homework hangovers this morning…which meant flying tennis shoes at the broken garage door (two weeks of an ignored work request)…which was the result of a temper tantrum…which was due to the low blood sugar (oatmeal uneaten) of the angry middle schooler/thrower of tennis shoes who missed the garage door sensor beam twice trying to outsprint the garage door…sprint blocked by the van halted mid-back-up….since the husband parked too close to the garage which meant more door slamming and nothing angelic about the pitch of arguing all the way to the bus. Here’s the t-shirt I made today with all my leftover frustration. 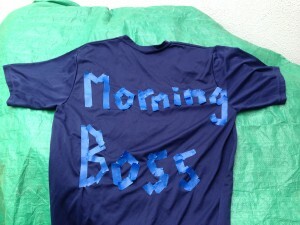 I used blue painter’s tape, shredding up the tape (a very satisfying activity–shredding–) to form the words, “Morning Boss.” I plan to sleep in tomorrow… and the t-shirt will circulate between the kids and my husband for the rest of the month….to help me stop my own insane behavior of needling them to rise, to shower, to eat, to remember their lunches, to get out the door on time to catch the bus…On second thought, maybe I need five “Morning Boss” t-shirts to remind us all just to be our own bosses. I also laughed the stress off with another mom at school…all I needed was that knowing smile from her. None of my family’s morning sparring was vindictive or “end of the world;” it was just another version of the necessary struggling going on under roofs all over town…that struggle to grow into the new patterns the wheel of Time presents us over and over again. Summer passes, and magically we have a fourth grader becoming a fifth grader, a seventh grader becoming an eighth grader, a freshman becoming a sophomore, and a mother moving a little further out into her public role as a wage earner as the kids (begrudgingly all, including mom, bittersweetly too) gain new layers of autonomy we both want and don’t want, autonomy we have to grow into gradually. And maybe sparring with family is a safe way to strengthen new muscles. May it prepare us for life’s unforeseen obstacles. May it also help us stand up for ourselves while having compassion for others and their growing pains in a more graceful way. I’d love your “Morning Boss” solutions in comments below: what has worked for you? 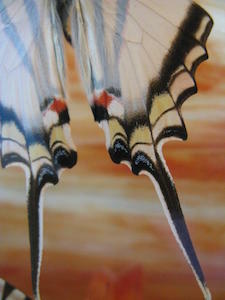 What creative solutions have sparring and sparring’s resultant frustration brought you and your family? Today’s Six of Wands card in the Rider Waite Smith deck gives us a depiction of a joyful, victorious rider seated with confidence in the saddle. The rider wears a laurel wreathe and carries a second laurel crown or wreathe on a victory stave. Companion riders flank the central Rider (Eden Gray labels him/her the “Lord of Victory”). So consider times your actions (will) were driven in a joyful manner by a trusting and loving heart (an attribute of the Lovers Arcanum) in such a way that you achieved success. 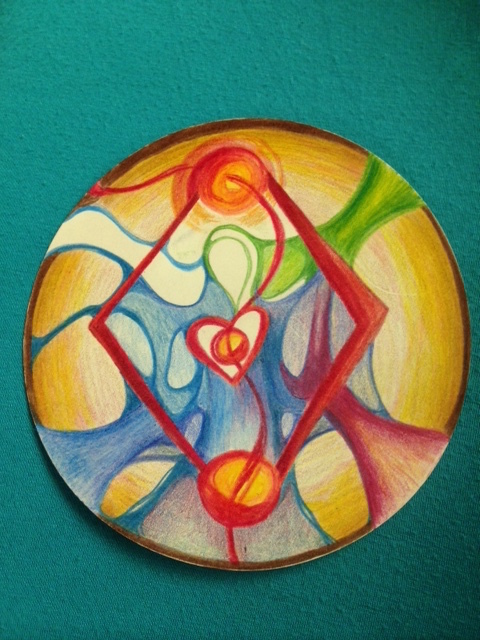 When were you able to lead yourself and others into an endeavor, heart driven, in a way that felt both loving (remember as mentioned above that all the Minor sixes connect to the Major Arcanum VI, the Lovers card) and victorious? Have you or would you like to ride forward with grace in celebration with others, your peers, or a team you have directed? Sitting upright in saddle, without apology? Where would you love to “wear a crown” in your life? 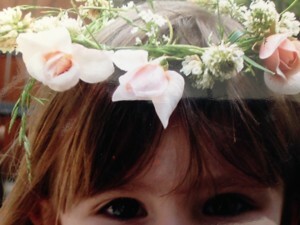 When was the last time you wove together a crown/garland of clover and dandelions? (I was in Iowa, graduate school, just finished playing tennis down by the Iowa river…no…I take that back…years ago, when she was about five, I made a wreathe for my daughter out of Cecil Breuner roses…) Remember? Why not make yourself a wreathe out of materials at hand this week. Think of your week’s crowning joy. Then put on your crown. Let me know what you made, what you celebrated, or post us a photo of you in your wreathe. 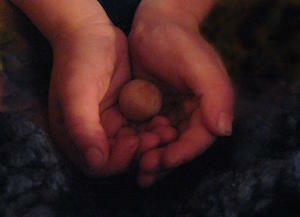 The first two photos in this post were taken by my poetry movie collaborator Robyn Beattie. 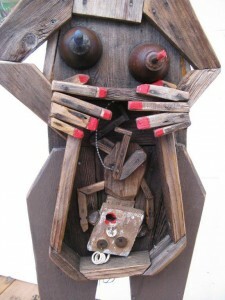 The artwork at the top of the post is a wood sculpture by a delightful artist from Sebastopol named 3D Eddy.